The Wood River Wolverines will be challenged by one of Idaho’s best football teams when the Skyview Hawks from Nampa visit Hailey on Saturday, Nov. 1 for a 1 p.m. State 4A first-round playoff game at Phil Homer Field. It will be afternoon football at the varsity level, the likes of which hasn’t been seen in Hailey since the Wolverines were playing their games down at Nelson Field by the Hailey Elementary School 40 years ago—before the building of the school district’s two new high school facilities and fields. For the first time in 19 years, and the first time ever as a 4A school, Wood River are hosting a post-season playoff grid game. The Wolverines (6-3) have their work cut out for them in the fall matinee with the Hawks (5-4). Don’t be fooled by Skyview’s season record. 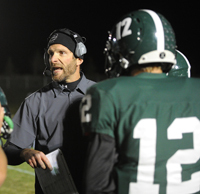 Twelfth-year Skyview coach David Young will bring a team that opened its season 1-4. Since, Skyview has reeled off four victories over Kuna (22-14), Mountain Home (67-18), Caldwell (48-21) and reigning State 4A football king Bishop Kelly of Boise (39-9) Saturday on the Knights’ gridiron. In those four wins, streaking Skyview is outscoring foes 44-16 on the average. They earned a share of the 4A Southern Idaho Conference regular-season title with Bishop Kelly (7-2) and Middleton (7-2) by walloping the Knights Saturday. That’s similar to last fall, when the Hawks (10-2, 44.0 ppg offense, 17.2 ppg defense) posted a school-record 10 straight wins and went all the way to the State 4A title game—ultimately losing to unbeaten Bishop Kelly (12-0) by a 42-34 score in the final at Albertson Stadium in Boise. That tailback is 5-10, 190-pound junior Cody Ghighina, a tough-to-tackle iron horse who rushed for nearly 200 yards Saturday against Bishop Kelly including lengthy touchdown runs late in the game. Skyview outscored the Knights 27-6 in the second half. Skyview 6-2, 205-pound senior quarterback Holton Hyde completed 20 passes against Bishop Kelly. He spent his junior year as a productive Hawks pass receiver during the state runner-up season. “It should be another 48-minute street fight, like the Minico game,” said Stilling. “We have talked about not meeting our goal of winning the conference championship. But now, our goal is to go 1-0 in the playoffs on Saturday against Skyview. Skyview may not be, either. The Hawks were looking for their first-ever state football championship and fell just short last November. The winner of Saturday’s Skyview-Wood River game travels to Bishop Kelly for a 4A quarterfinal playoff game on Nov. 8. Yet Wood River is a team that has faced many obstacles. Stilling’s team has bounced back from a 1-8 season to win three of its games by a grand total of five points, to lose two games by three points, to breeze in three routs by 19, 32 and 35 points, and to lose only once in double digits, by 18 points last Friday to Minico. Leading scorer Gunner Gibson, a junior tight end (20 catches for 587 yards, 9 TD), is expected back after serving a one-game suspension for a game ejection in Wood River’s playoff-clinching 21-20 home win over Canyon Ridge Oct. 17. Top Wood River rusher is sophomore Ashton Owens (613 yards). And the team’s leader is junior quarterback Alec Nordsieck (1,623 passing yards, 18 TD plus 475 yards on the ground, 7 TD). Another junior, Jubal Toothman, is Wood River’s leading tackler. Other first-round games in the 12-team tournament this weekend are Middleton hosting Great Basin Conference third-place Canyon Ridge (the winner facing Minico), Sandpoint hosting Century (winner visiting Blackfoot) and Rigby hosting Kuna (the winner going north to Lakeland in Rathdrum). In the 30 years since the Idaho High School Activities Association has conducted a 4A state playoff, eastern Idaho teams have won 19 times, Boise-area teams on seven occasions and northern Idaho teams four times. No south-central Idaho squad has won a 4A state title.